I am a long term planner. I am a mover and a shaker. Sometimes to a fault. I am learning more and more over time that there are some things that just can't be planned out to a perfection. How stinking frustrating is that?!!! Tonight my plans were to calm the boys early with a movie and have some quiet moments but nope... they wanted a sleepover. Seeing as it is spring break I conceded. So instead of quiet I had 5 little boys running around in the dark playing hide and seek, wrestling, and a build off of flame shooters! I am now surrounded by constructs, pizza boxes, and passed out little boys all over the family room. Tomorrow Makenzie will have an ABM lesson with Tonya and Andrew. Tonya will be going with us to Costa Rica. Makenzie really likes her and I am sure it will be a great lesson and conversation about our trip to the ABM Center! Please continue to pray for healing. Pray also that God would continue to make His path clear. Pray that He would give me clarity and peace in the decisions that need to be made now and in the future!! Even though we are no where near the ocean we ventured out to the Aquarium on the first day of spring BREAK. I am not sure why they call it a "break" but oh well! Makenzie just loved to watch the fish. She had a great time watching her brothers climb the big trees, she thought touching and feeding the sting rays was interesting, she cried big alligator tears when she got her face painted, but she laughed huge belly laughs on the 4D Sponge Bob ride. All in all it was a great trip for everyone! There were just too many pictures to post separately so I made a short slide show...enjoy! I have so many thoughts running through my mind right now. Makenzie is doing so well. We are embarking on another trip to Costa Rica for stem cells in less then 2 weeks. I love ABM and what it has to offer my daughter. I love Makezie's therapists. We have been doing a ton of traditional therapy for 3 years now and now the BIG question is... do we try something completely different and what does that look like? Or maybe we try to merge the two methods, or do we just continue what we have been doing. This is so hard and I don't even know how to begin making any of these decisions. There are so many voices in my head.... yes now I am hearing voices... hehehe ok maybe not voices but a better word might be opinions. It can not be said that what we have been doing has not worked for Makenzie.... because in a HUGE way it has but is it time to move on something different? Is it time to give ABM our 100% commitment? Is my family up for supporting us on this new endeavor because it will require a lot from them. For tonight I am going to let all of the voices and opinions go and lay it before the true healer! 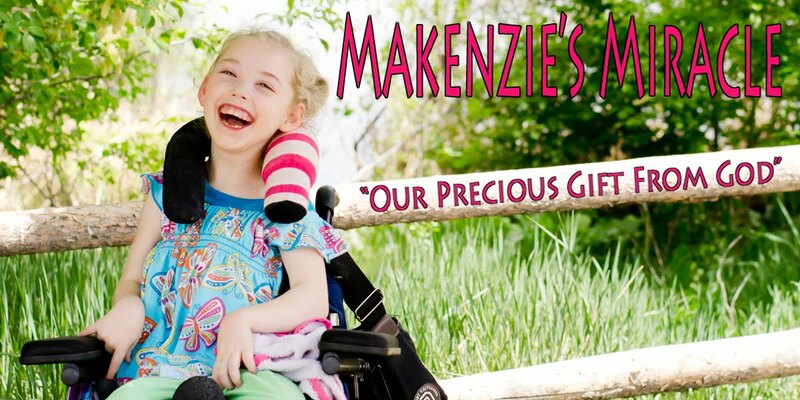 Please pray that God will give me His voice and allow me to make the best decision possible for Makenzie! The flight home went very good! We made it to the airport by about 5:45am after missing the 5am shuttle. Oops! Makenzie is a fabulous little traveler! I guess we have done it enough to be pros by now! Here is a picture of San Fransisco at 4:30am! Way, way to early to be awake but it was so beautiful! I was able to take a short nap which felt really good! Makenzie is sound asleep after our long day and the boys are just hanging out. I was royally spoiled while we were in CA with all of Andrew's help. It was a real treat! So I promised a really cool "story" a couple of day ago. So here is goes. While hanging out one day a family of 5 road up to the front of the hotel on a quint bike. There was a mom, dad, and 3 little girls. At first glance they we maybe 3,5, and 7 years old. Out of curiosity my friend Lisa started to talk to them. Here is the crazy amazing part...... This family started riding their bike Aug 1st 2009..... their kids at the time were 6,4, and 2.... they started peddling in Kentucky With $300 in their pocket and a desire to show their girls the country! When our paths crossed , the Pedouin Family had made it to San Fransisco......4433 miles. The goal is to get all the way to ALASKA!!!!!!!!!!!! For me my first gut response was that they were NUTS!!! The kids looked happy and healthy and none worse for the wear but still in my head I am thinking " are you CRAZY"
Thank you to everyone that made our trip to California possible! Thank you for all of the generosity and kindness, prayers, physical help, monetary help, and utter love and desire to help Makenzie in any way possible to heal!! From the bottom of my heart! THANK YOU!!!! Here are the pictures of our detour to the beach on Friday night on our way to the hotel. We are staying in San Fran tonight so that we didn't have to make the hour long drive to the airport in the morning at 3:30 am! Makenzie had 2 GREAT ABM sessions today. She is really working on NOT moving and letting her body be still. Any time Makenzie tries to move or has someone try to move her the flexion kicks in. Learing how to control that is paramount in getting her movements more fluid and funtional. I am really impressed with this week and how fast Makenzie is learning these new skills. On our way into the city we decided to stop at the beach. I am so glad we did! We parked on the street and had a nice. walk to the water. Makenzie just giggled and was so happy. It was a bit cold and the water was freezing but I let makenzie put her feet in the waves a few times! We picked up some sand dollars for the boys and headed back to the car. I am so excited to get home to my boys! We take off at 7am tomorrow. I am sad to leave but know we will be back soon! Pray for safe travels tomorrow! I have some pictures that I will post tomorrow but as much as I love you $15.00 was a bit much to pay for internet to post this so I am using my phone! God was so present on this trip! Thank you for all of your support! 1, 2, 3, Jesus Loves Me! Today was the day 3 years ago that would send my families life into a different direction. A direction of hospitals, doctors, specialists, therapists, ABM, stem cells, neuro suits, feeding tubes, wheel chairs, IFSP's, IEP's and the list goes on and on and on and on. Now putting all of that aside, this new direction also brought people into our lives who have touched us in ways that have changed our lives forever! I have made so many goals and feel like there is a purpose in all of this and for me. Not that being a mom to four kids wasn't a good enough purpose because it was but God had something else in mind! We were in the perfect place for this anniversary today. Surrounded by people that BELIEVE in Makenzie! Yes we have support and believers all around us at home too and is such a great blessing but meeting more people who also believe in God's miracle's and who have new hope and fresh ideas about Makenzie's healing is just breath taking! Makenzie had a great lesson this morning with Sylvia and then it was back to the hotel for some rest. I needed to do a couple loads of laundry and by the time is was all said and done I had slipped $12.00 into those machines!!! That should be illegal! After resting we had our second lesson with Anat. AMAZING! I have a LOT to think about. I spent the rest of the afternoon and evening with a headache. I am emotionally drained! I will try to elaborate tomorrow but tonight I am just too tired! I also have another CRAZY story about a family we met yesterday to tell you. It made me think about all of the amazing things we can accomplish if we set our minds to it! It will blow your minds away! Thanks for believing in Makenzie for the last 3 years! She has come so far! Makenzie is a far cry from the baby we stood over 3 years ago tonight not knowing if she would live. Trying to sleep but knowing that sleep would never come. Wishing what we wanted to be a bad dream would end! Today I tell you .... it HAS!!! Makenzie may not be the same girl as I gave birth to in 2005 but she is PERFECT! I will never stop fighting to help her regain the skills she once had but life is good! I have spent the last week laughing harder then I have in a long time. Makenzie being the instigator of most of that laughter! My girl is so happy and so full of life! What more could I seriously ask for!?!!! Please keep praying for my princess! ABM continues to just leave me breathless. I realize that this is not a quick fix but the changes in Makenzie have been just wonderful. Today after Her second lesson I asked the practitioner if she noticed a change in Makenzie's body. The response was a most defiantly ....yes! Makenzie was a bit more flexed today but she worked through it. She did a wonderful job putting weight into her elbows, arms,and feet. She also did a great job rolling to sit. The other thing that has been very noticeable is an increase in Makenzie's height. This is because her spine is straighter, her posture in gravity is better. Remember the car seat straps? Yeah I do! After her lesson Makenzie and I headed to the beach with Lisa, Holly, and Camille. Lisa brought a picnic lunch. Makenzie laughed all the way up to the beach on the super windy, cliff ridden, 2 lane narrow road, while I burred my head in my lap praying we would not fall off the side of the road. The beach was a bit cool and windy but Makenzie loved putting her feet in the sand. I let her go down to the water despite the cold and put her feet in the surf. She was so happy and giggly! She walked so well and didn't want mommy to take her away! While we were at the beach I decided to give feeding her a go. She did GREAT!!! I mean really great! There was no coughing, she opened her mouth for each bite, and closed her lips a ton!! Then when it got to cold we headed back to the car and had key lime pie and lemon meringue for dessert. She loved it! When we got back to the hotel I got something to drink and Makenzie just kept looking at me and babbling. I asked her if she was still hungry and she preceded to eat MORE! GO MAKENZIE!!! Before bed I decided to try to put her in one of the positions that she had been in during one of her lessons. She LOVED that too! Her head went right up and she had NO problem with her feet being flat on the ground! Right now all is quiet. Makenzie is sound asleep. She has been sleeping GREAT. I am pretty sure she has not gotten up before 8am yet! I am going to go join her in dream land! We have another lesson with Anat tomorrow afternoon!! Please pray for God's healing power through Anat and Sylvia tomorrow! Is it possible for day 2 to be better then day one? YEP! Makenzie had 2 wonderful lessons today. Both of the practitioners that worked on Makenzie today took time to watch the hour long consult that we had with Anat Baniel yesterday so they could see how Anat worked with her and get an idea of some of the important points to concentrate on. Makenzie had a wonderful lesson with Neil. We saw great improvement. He worked a lot on her continuing control over her flexion, rolling onto her elbows and stomach, a bit of supination, and freeing her jaw mouth and tongue. After her lesson with Neil we decided to stay and hang out meeting a lot of other parents and their children. We even got the pleasure of a mini parent lesson from Anat. Makenzie's arms continued to be loose enough to lift above her head for the remainder of the afternoon and into the evening. Makenzie's second lesson was with Sylvia. This was the first lesson Makenzie has had with her. It is just amazing to me the different styles and interpretation that each different practitioner has of the ABM method. Each incredibly important! Sylvia worked with Makenzie on the floor she did a lot of functional movement including, coming up onto her knees, reaching for a toy over a roll,side sitting, tailor sitting, hand to foot using her feet and legs to show are hands how to move and bear weight, rolling up to sit, and getting weight through her feet in a squat. When we went to put Makenzie into her car seat we had to adjust her straps because she had gained so much length in her spine that it made her to tall to fit! After our full day of ABM we went to dinner with some old friends we met almost 2 years ago in Florida at our first IMOT session. We enjoyed some Puerto Rican Food at Sol Food. It was so great to catch up and the kids did pretty well considering they had such busy days! Tomorrow or Thursday we are going to join them again for a picnic on the beach! Makenzie is going to LOVE that! We are so enjoying our time here! Even though we are doing therapy we have had a good amount of down time and it has been much needed! I want to say a big thank you to all of those that have made this possible! We took Makenzie down to look at the fish this morning! She was very intrigued. Makenzie had her first two lessons today at the Anat Baniel Method Center. To say it went well would be an understatement. Neil was great. He worked a lot with Makenzie's arms, chest, legs, low back. Makenzie showed off her bridging and worked flat on her back for a long time. He got Makenzie's right arm over her head and Makenzie initiated rolling onto her stomach. With some assistance so was able to put weight into her elbows prone with her head up very nicely. When we left she felt so good. We came back to the hotel and I laid her on the couch. She hung out there on her back for a long time playing with her shakers. Watching her purposeful movement in getting the toy to her mouth was amazing! She was bending her arm and moving it to her mouth so much better missing her target only a few times. I took video but I am just too tired to edit and upload it! Not to mention it would take forever on this super slow connection. About 3 pm we were on our way back to the center for our first appointment with Anat Baniel!!! I was so so excited but really had no clue what to expect. Anat was AMAZING!!! She asked a few questions while beginning to work with Makenzie and picked up on many of her physical roadblocks very quickly. Anat worked a ton on her chest, and arms. Then she worked with her flexion. I wasn't sure if I wanted to laugh or cry. She got very stern with Makenzie. A sternness that I do not ever use with her. I decided to laugh and turn away so I wouldn't distract Makenzie. Anat also asked Andrew and I not to even look at her so that she would have all of Makenzie's attention. Anat recognized Makenzie's ability to control her body patterns and gave Makenzie the opportunity and structure, demanding that she learn how to self regulate. Guess what happened? As the lesson went on Makenzie began to flex less and less ending the session with a very quiet and loose body. Notice how Makenzie right elbow is several inches from her body resting on her elbow with her wrist loose hanging over the edge. HUGE! I can not wait to see what tomorrow brings! Please pray for God's healing touch through all of the practitioners that lay their hands on My precious baby girl!!! We made it!!! We had a great flight and Makenzie did amazing during the drive into San Rafael! There is water everywhere around here and Makenzie LOVED it! She loved looking out the window at the boats and birds! Andrew and I both laughed when we saw this sticker while driving through south San Fransisco. On the way to San Rafael we were able to drive over the Golden gate bridge! BEAUTIFUL! We were able to walk around a bit when we got to the hotel. There is a huge waterfall in the lobby and a bunch of ponds with some huge fish.... guess who loved that....hmmmm.... I will give you 2 guesses but the first one doesn't count! Andrew and I sat down for a few drinks and some dinner. Makenzie was such a good girl and watched all the people coming and going! What a nosey little girl she is! LOVE IT!!!! Makenzie is now peacefully sleeping. I am sitting here thinking about how blessed my family is! How blessed Makenzie is! She is just so amazing! Thank you for all the prayers for safety! Please keep praying! This is a BIG week and excited just barley begins to describe my feelings right now.